The Fourteenth of the Line - Lord Iemochi (Shotoku-in) - Lively scene of the Lord Iemochi, the fourteenth Tokugawa Shogun, watching a mock battle at Osaka Castle. 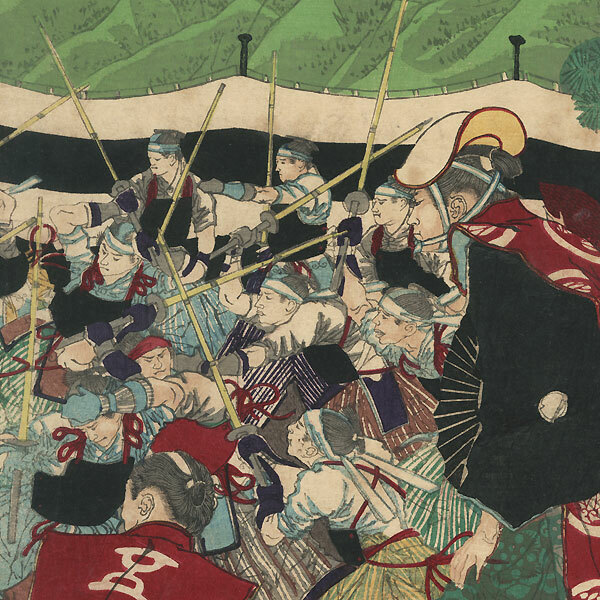 Armed with bamboo practice swords, the men attack each other as Iemochi sits on a folding stool atop a small hill beneath a striped tent at right. The combatants wear chest plates over white robes tucked into striped pants, the two sides identified by red or white headbands. A black and white striped cloth panel encloses the fighting area, with the castle in the distance. An intriguing scene, nicely detailed with burnishing on Iemochi's black kimono and the folding stool. Condition - This print with excellent color and detail as shown. 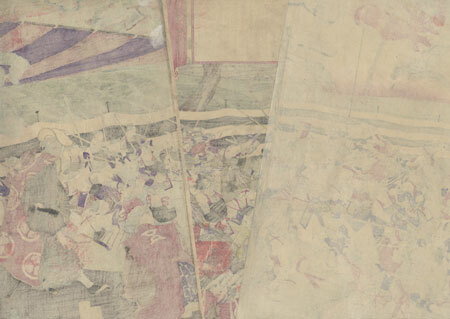 Three separate panels, left panel backed with paper. Loss at edge, slight separation at ends of vertical fold in each panel, a few holes and thinning spots, repaired. Slight toning and soiling, slight rubbing at edges. Please see photos for details.